Jabalpur: In a significant order today, a Division Bench of the High Court of Madhya Pradesh (Jabalpur Bench) comprising Hon’ble Jst. Rajendra Menon and Jst. Moolchand Garg directed a complete stay on all sand mining operations in the Sardar Sarovar Project affected areas in the state and called upon the Govt. of M.P. to furnish complete details regarding the mining activities in the project areas. On 26/3/2015, the Hon’ble Chief Justice A.M. Khanvilkar issued a specific directive to the Collectors of all the concerned districts to “file affidavit and provide in tabular form the names of lessees, date on which lease permission was granted and date on which the land in respect of which lease has been granted, has been vested in NVDA. Other relevant information also be furnished”. Despite being granted two extensions on 7/4/2015 and on 22/4/2015, the Govt. failed to provide the information with details as sought for by the Court. Notably on 22/4/2015, the Govt. was directed to file the reply within 3 days, failing which the Court threatened that all sand mining would be stayed. Despite the Court’s severe warning and specific directives, the utter non-compliance of the State came a shock to the Court. Although a so-called ‘Compliance Report’ was filed on the 25th April, with regard to sand mining leases in the Badwani and Dhar Districts, the same did not contain, rather concealed, the details sought i.e. when were the lands in question were transferred to the NVDA, names of lessees and dates of leases. NBA filed a reply and proved with specific examples from different villages as to how land vested in NVDA almost 10-12 years ago has been leased out for mining by the State. Pleading for the petitioners – NBA and SSP oustees affected by the mining activities, Medha Patkar urged the Court to forthwith stop all the mining activities in the areas, since the same is in gross violation of the directives issued by the Supreme Court, the National Green Tribunal and also constitutes a criminal offence under the Penal Code. Counsel for the State, Swapil Ganguly pleaded that notwithstanding the fact that the lands have been vested in NVDA, the Govt. of M.P. has sovereign rights with regard to the acquired lands, including grating permissions for mining activities. However, the Court refused to consider the submissions by the State today, in the absence of the specific information sought from previously. The Court directed the State Government to immediately file a detailed reply with complete information in terms of the Order dt. 26/3/2015. The Pollution Control Board and Union Ministry of Environment and Forests were also directed to filed detailed replies at the earliest. 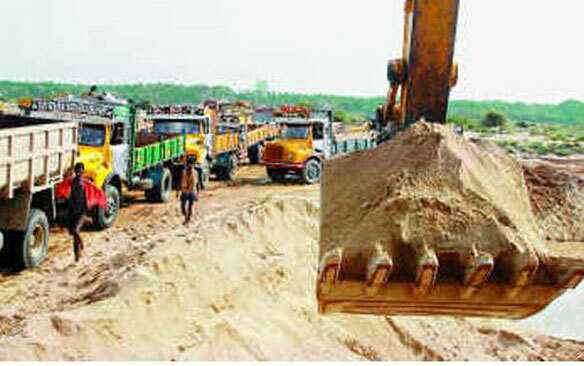 The Order was passed in a major PIL filed against the large-scale, reckless sand mining in the Narmada valley, especially the SSP submergence and catchment areas, leading to adverse impacts on the riverine ecology, ground water, reservoir fish and causing major revenue losses to the state exchequer, crores of corruption. The mining also has major impacts on the life-span of the Dam itself. Although the PIL was filed in June, 2013, the first effective order has been issued today, almost 2 full years, during which detailed pleadings have been exchanged between the parties – GoMP, NVDA, PCB and NBA and the PIL was transferred twice from Jabalpur to Indore and back to Jabalpur. NBA welcomes this Order of the High Court, as a significant check towards arresting the unregulated and unlawful mining in the Narmada valley, by the omissions and commissions of the state agencies, mining department, revenue officials, police as well as the local goons involved. The matter has been listed on 12th May for further hearing and orders. Adv. Ashish Srothi appeared for the PCB and Adv. Arpan Pawar appeared for the NVDA.